August was such an action-packed month that it flew right on by. In case you've been out in the sun and out of the loop, we've got some highlights from a month of radical news for you. First up is some fantastic video coverage of the third annual Unis'tot'en action camp up in Wet'suwet'en territory. Over 150 Indigenous people and grassroots allies converged to support the local struggle to block the construction of the Pacific Trails Pipeline natural gas transport project. Also in August, the Forest Action Network announced that the fight against pipelines achieved a victory when Vancouver City Savings Credit Union divested Enbridge stock from its Socially Responsible Investment funds. The Continental Day of Action Against Canadian Mega Resource Extraction was covered by VMC, with audio, video and photos about the local action in solidarity with communities resisting Canadian mining throughout the hemisphere. And there are some great photos of an information picket by Queers Against Israeli Apartheid at the Vancouver Queer Film Festival. Curious about stories that we haven't been covering? Want to find out more about different local issues and struggles? Become a VMC ninja! Not sure where to start? 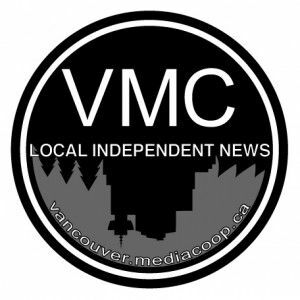 You could try your hand at an interview, blog or photos at an event, like tomorrow's Save the Salish Sea Festival, the Victoria Anarchist Bookfair, the 6th Annual Women's Housing March, or She Speaks: Indigenous Women Speak Out Against Tar Sands. And you can always post an event or news release to let everyone know what else is happening. For a blast from our recent past, check out a video comparing alternative media centres set up as part of the 2010 anti-Olympic convergence in Vancouver and the anti-G-20 protests in Toronto. We'll be having our Wednesday evening meetings every couple weeks this fall, so drop us a line anytime at vmc (at) mediacoop.ca if you want to get involved or have a story idea. Or if you find some spare change in the couch or mad stacks under the mattress and want to become a sustainer. See you at a meeting, online, or in the streets!